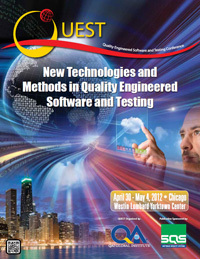 The Quality Engineered Software and Testing Conference (QUEST) brings together professionals from a range of IT disciplines for a week of learning, sharing, and networking. To start the conversation, QUEST has invited industry thought leaders, evangelists, and innovative practitioners to contribute papers on the most pressing topics in the field. We invite you to read, share, and join the discussion online as a member of the QUEST LinkedIn group. Maintenance Phase Testing – The Significant Value in Doing it Right!